Caisteal Na Nigham Ruaidhe, Loch Avich. Plan. Caisteal Na Nigham Ruaidhe, Loch Avich. Plan. 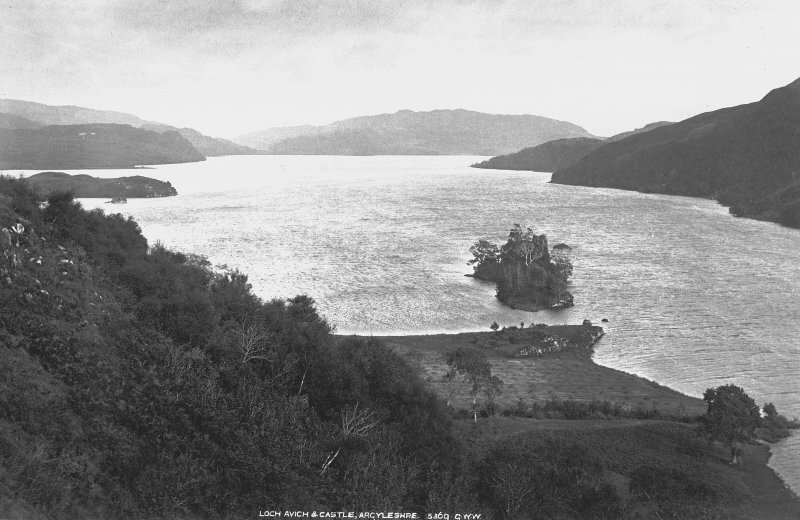 Insc: 'Caisteal Na Nigham Ruaidhe, Loch Avich, Argyll. Surveyed By GF and AL 5.6.71'. Visited by OS (WDJ) 14 October 1969. 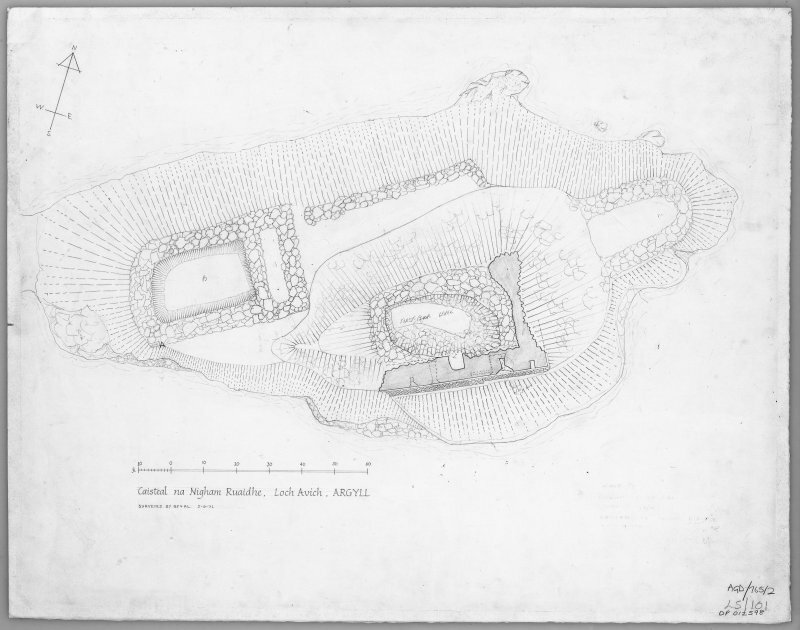 The ruins of this ancient castle stand on the islet of Innis Luana near the SW end of Loch Avich. 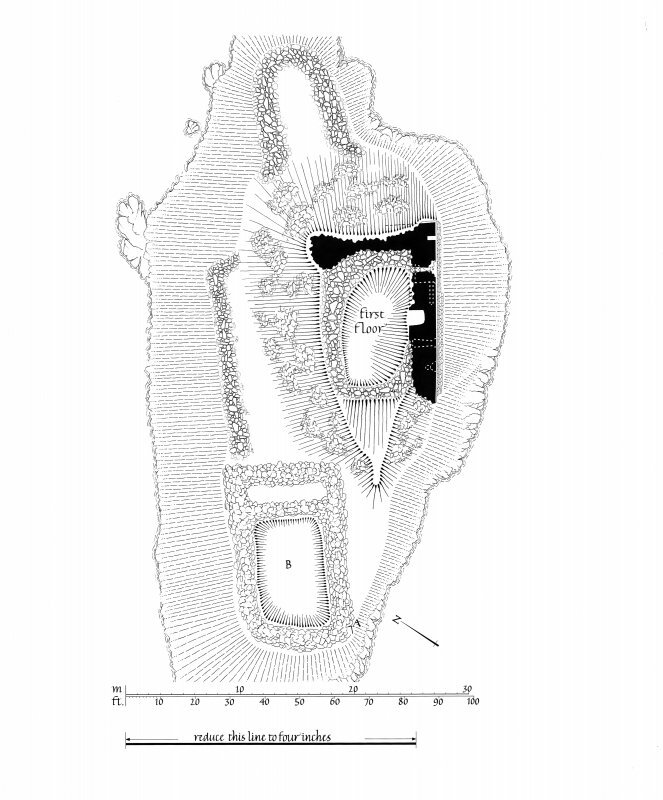 The castle occupies the eastern portion of the island and the remains comprise an oblong tower-house standing within a defensive enclosure which contains some remains of outbuildings. The SE wall of the tower-house stands almost to its full height, but the remaining walls are fragmentary. The building evidently had at least three storeys and appears to have measured about 15.8 metres SW-NE by 11.3 metres at second-floor level over walls 2.3 metres thick at the same level. Except on the SE side, where the tower-house stands directly above the shore the eastern portion of the island appears to have been enclosed by a stone wall, now very ruinous, but with evidence of lime-mortar construction. In the NW corner of the enclosing wall may be seen what appears to be the jamb of an entrance doorway whilst within the walls at this point are the remains of a small sub-rectangular building measuring about 16.1 metres SW-NE by 10 metres overall. This appears to have been a dry-stone construction divided into two apartments. Almost nothing is known of the history of this castle, but it was a stronghold of the Campbells. It was certainly in existence in the early years of the 15th century and it may be as early as 13th century date.